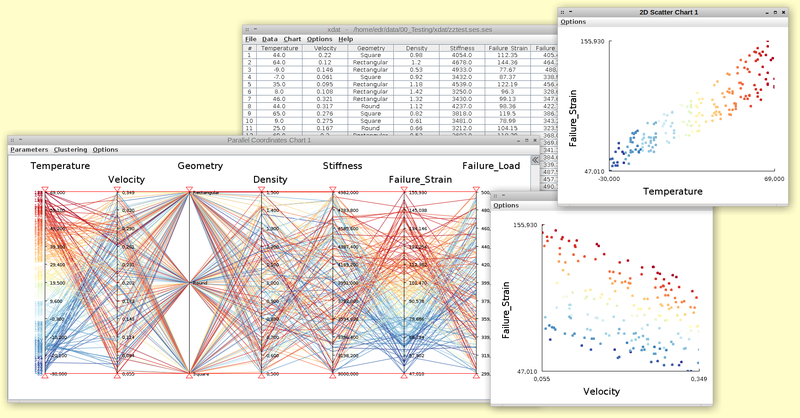 XDAT stands for X-dimensional Data Analysis Tool. This name has been chosen because XDAT is particularly useful to analyse multi-dimensional data. This is achieved by using parallel-coordinate visualization invented by Alfred Inselberg. See the overview section of this site for an introduction to the use of parallel coordinates for data analysis. That section will walk you through an application example to make you familiar with this core feature in XDAT. Since release 2.0 XDAT also supports plotting data in 2D scatter charts. The columns of the dataset that are displayed on these scatter charts can be changed on the fly by just one click. This makes it very easy to scan through all parameter combinations and quickly find patterns in how they are correlated to each other. You can either download a compiled version of the program that is ready to be run directly (no installation required! ), or the fully documented java source code. Note that admin rights are not required to be able to use XDAT. See the installation guidelines for more detailed information. Although XDAT is quite self-explanatory, a user manual is available. To get started with XDAT a file containing sample data is included in the distribution. XDAT is free software licensed under the GPL. I hope it will be as useful for your work as it is for mine. If you have any questions or comments or if you want to report a bug you can contact me via email.